Published: June 7, 2013 at 02:29 p.m. Updated: June 7, 2013 at 10:08 p.m.
Bad weather forced the Green Bay Packers indoors for the annual team-bonding exercise that concludes veteran minicamp. Undaunted, Packers coach Mike McCarthy led his team into the bowels of Lambeau Field, where they took part in a dodgeball tournament. This was a tremendous idea. The winning team was led by Aaron Rodgers (naturally), who leaned on the lessons gleaned from a decade-old Ben Stiller comedy. 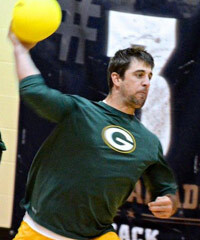 "I've watched 'DodgeBall' many times, and I've followed the five D's in dodgeball -- dodge, duck, dip, dive and, of course, dodge," he said, according to the Packers' official website. "Patches O'Houlihan and I are good buddies." The title match ended with drama, as James Jones and Jordy Nelson squared off against Rodgers and rookie offensive lineman Lane Taylor. "It's not always about the first picks," said Rodgers, who certainly seems to be one of those guys who's the best at everything. "It's sometimes about the late-round guys that come through for you, and they did." Packers.com has a remarkably detailed rundown of how the final moments of the tournament played out. It appears Nelson wore the goat horns ("I blew it."). 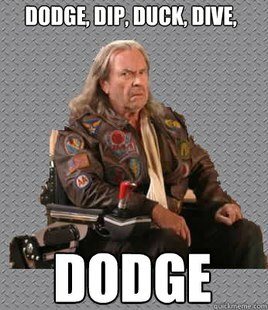 As an aside: "DodgeBall" merely is an OK movie with several very funny moments. Chief among them is the scene where Lance Armstrong, playing himself, gives an airport pep talk to Vince Vaughn's character. That special intersection where intentional and unintentional comedy meet.